The money would go towards improvements at the club’s Triangle ground in Mill Lane, including refurbishing of the kitchen and bar, ground maintenance and upgrading the changing rooms and toilets. The club would contribute another £3,000 towards the work, which is designed to help increase its revenue by offering better facilities. The loan would be paid back over five years and would not be used to pay off the club’s debts, which are currently more than £22,000 and include £7,000 in unpaid electricity bills and personal loan repayments. The club was forced to pull its first team out of the Hellenic League, the ninth level of English football, earlier this month due to its financial problems. Paul Sykes, a member of the club’s new management committee, told councillors that the club had been struggling with cashflow. Speaking at a meeting of the council’s finance strategy and management committee, he said: “The club has had its ups and downs financially and in its management. “People around the club have put their hands in their pockets to loan funds to the club to help with running costs and any other debts. “We are now starting to turn a corner and have a new management committee. We have started to dig us out of what was a financial mire. “In the six-month period from May to October, we had revenue of £25,000. “The new committee has galvanised the club and we have a long-term ambition to pull the football community together. We have a new energy and focus with the objective to drive the club forward. 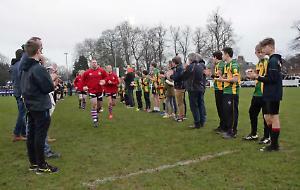 The club’s business plan for 2017 to 2022 says it wants rewire and replumb its clubhouse and will apply to South Oxfordshire District Council for a grant. It also plans to install solar panels and LED floodlights to reduce energy costs. The aim is to secure the club’s future for the next 20 years and focus on attracting players from the town and surrounding area. It would work with AFC Henley, which provides youth football in the town, in setting up an academy to provide a pathway into adult football. Mr Sykes said the more local players the club had, the greater its revenue would be. He said: “This would help increase takings in the bar. Local players stay in the bar after the game whereas players from outside the town do not. Councillors agreed unanimously to recommend the loan application is accepted. A final decision will be made by the full council when it meets on January 3. Henley’s reserve and Sunday sides continue to play in the Thames Valley Premier League and Reading and District Sunday League respectively.